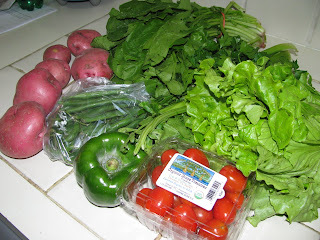 Clearly I have fallen out of the habit of doing weekly CSA updates, seeing that Saturday, Week 12 is upon us and I've not even posted on Week 11. Here it is above, working clockwise from the left: new potatoes, spinach, celery, lettuce, grape tomatoes, green pepper, green beans. These particular weekly "what's in the box?" updates seem a bit superfluous, given that the Bee Heaven newsletters are available online and that Redland Rambles provides such nice pictures every week too, a day in advance of the delivery even. Those potatoes were exciting, if for no other reason than that we hadn't gotten any potatoes yet, and I was torn between doing a Pommes Anna and a Tortilla Española. 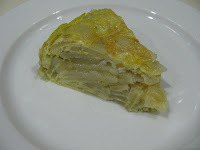 The tortilla, a Spanish classic which can be found in just about every tapas bar in the country, won out. 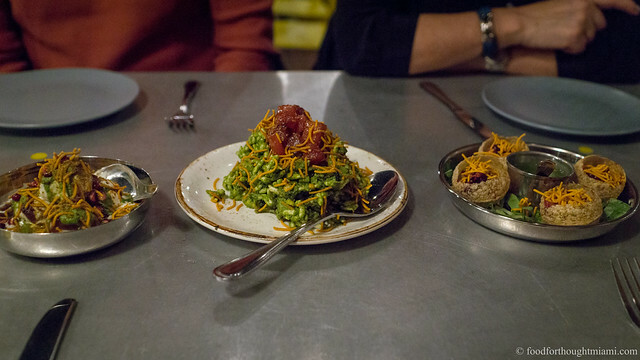 This recipe is taken from Anya von Bremzen's wonderful cookbook, The New Spanish Table . 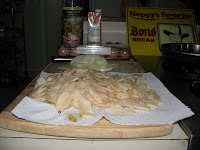 The recipe calls for 3 medium-sized potatoes, peeled, sliced thinly (a food processor's slicing blade is recommended), dried on paper towels and rubbed with salt; 1 1/4 cups of olive oil; 1 onion, thinly sliced; 6 large eggs; and 2 tbsp chicken stock. Heat the oil in a large skillet (it's a lot of oil, use a big pan) over medium-high heat, then bring the heat down to medium-low and add the potatoes. Cook, stirring periodically to keep the potatoes from browning or sticking, for about 7 minutes; they won't be cooked through. Add the onion, stir it in, bring the heat down to low, and cook for another 15 minutes, stirring occasionally. Everything should be nice and soft but not browned. 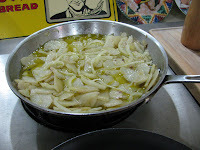 Remove the potatoes and onions from the pan with a slotted spoon, and drain in a colander set over a bowl to catch the oil. Salt the potatoes and onions to taste. Reserve the oil, you'll be using some of it again shortly. Meanwhile, beat the eggs with the chicken stock and a couple pinches of salt. Once the eggs are scrambled, stir in the potatoes and onions (break up the potatoes a bit with a fork) and let them sit for 10 minutes. Put an 8" skillet (non-stick is a good idea) over medium-high heat and add a couple tablespoons of the reserved olive oil. 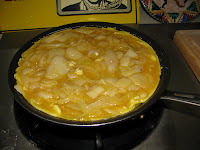 When it's hot, add the egg-potato-onion mixture and bring the heat down to medium-low. It will just about fill the pan. Use a thin spatula to pull the edges away and let more egg mixture seep underneath. Cook it this way for about 6-8 minutes, until the top is no longer completely liquid. Now comes the fun part - you need to flip the tortilla. It's all about confidence: if you think you can do it, it'll work. Run the spatula all around the edges, and as far underneath as you can, to ensure the tortilla won't stick. Put a plate (bigger than the skillet!) over the top of the skillet, then with one hand holding the plate and one holding the skillet, invert the pan (and the tortilla) onto the plate. In an ideal world, you'll now have a tortilla with a still-somewhat gooey bottom on the plate, and an empty pan. Add a little more oil to the pan if needed, reduce the heat to low, then shuffle the tortilla back into the pan, gooey side down, to finish cooking. It should take about another five minutes. The recipe recommended one more flip and trip back into the pan for another minute, this seemed unnecessary to me. Check to see if it's done all the way through by sticking a toothpick in the middle and seeing if it comes out dry. When it's cooked through, slide it out of the skillet onto a plate and let it cool a bit, then cut into wedges (or however else you might like) to serve. A couple thoughts. First, I wonder if all that oil is really necessary for cooking the potatoes, though it might well be, since the idea is really to sort of poach them rather than sauté. Second, as you can see in the final photo, mine seemed to separate a bit, with the egg retreating to the exterior of the tortilla and the potatoes layered in the middle, more like an omelette than the homogeneous egg-potato-onion concoction I'm accustomed to at tapas places. Maybe a longer soak for the eggs and potatoes before cooking was in order. I think you've got your solution exactly wrong. The rest is letting the potatoes and onions settle in the egg mixture. Stir them up and pout it into the pan while the potatoes are still floating around; that's always done the trick for me. Still, really nice loft on the omelet. That's the part I have trouble with. I stirred it up again when it was going into the pan, so I don't think the soak time is the culprit. May have just been too much potato to egg (though the recipe called for 3 medium Yukon Golds, and the CSA new potatoes are certainly no bigger than a Yukon). I think the "loft" is just the product of using a small pan. With an 8" skillet, 6 eggs & 3 potatoes, it was right up to the edge. OK, then it's the potato to egg ratio. It does look a bit high in the picture. I actually have that cookbook, and generally give it good marks. But in this one instance, the recipe did you in. First, there is definitely too much egg to potato. It should almost be a 1:1 ratio. Second, the addition of the chicken stock is unnecessary and probably added to the runniness. Second, from the pictures, I don't think your pan was hot enough. You should start with a med high heat, then turn down after a minute. This helps it set. 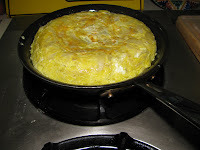 And for a proper spanish tortilla, you don't want any puffing or loft. It should be dense. Next time, try this recipe from Fine Cooking. 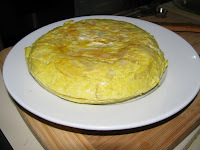 I lived in Spain, and I have found this to be the best, most authentic recipe. And as to the oil, you can steam or boil the potatoes, but if you don't use the olive oil, you lose some significant flavor. Good luck in your next attempt! Susan - Thanks for the tips and the pointer to an alternate recipe. I've generally had pretty good lucking cooking out of this book too. Though I will say that if anything the problem was not that there wasn't enough potato, but rather too much. The focus in the final picture is lousy, but it really almost resembled a potato gratin more than a tortilla, basically layers of potato bound by a bit of egg. Also I prefer my tortillas more on the runny side and so purposefully kept the heat lower, rather than seeking more browning on the exterior - though the chicken stock addition did have me somewhat puzzled.